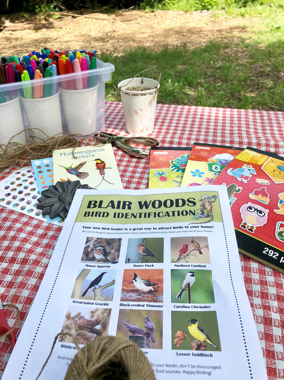 This past Saturday, April 14th was the first in a series of nature days this year at the Blair Woods Sanctuary, aimed to engage families about this important natural area. The former site of the Ft. Colorado historical marker and a dairy farm has been in the process of restoration for the past 20-30 years due to habitat degradation. 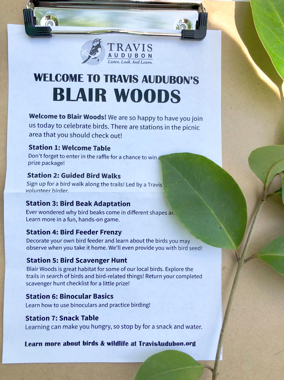 I completed the Travis Audubon Master Birder Program in 2017 and am required to do at least 30 hours of volunteering the following year. 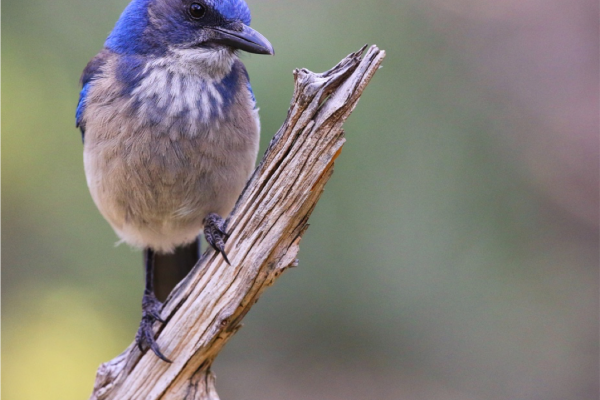 Having been there once before on a field trip and having fun memories tracking the biggest blue jay I have ever laid eyes on, I thought this would be a good event to start off my hours at. 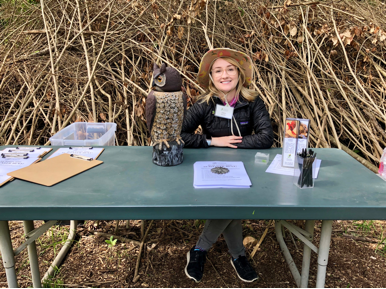 Seven tables were set up, including the welcome table, meeting point for guided bird walks, bird beak adaptation, bird feeder frenzy, bird scavenger hunt, binocular basics, and of course a snack table. I was in charge of the bird feeder frenzy table where you could decorate a paper cup with fun colored markers and stickers before punching holes and stringing through twisted rope. A bag of no mess bird seed mix and a bird identification sheet was sent home with everyone to attract birds to their backyard for their viewing pleasure and identification practice. I enjoyed meeting the families that stopped by and loved seeing all the kids embrace the activities we had planned. 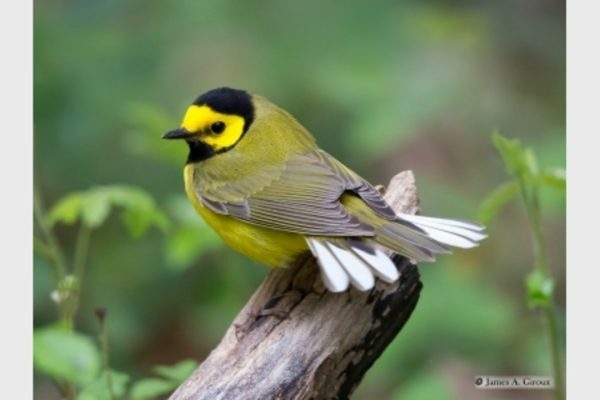 It was a cool breezy morning, but there was no shortage of birds spotted on the guided bird walk. 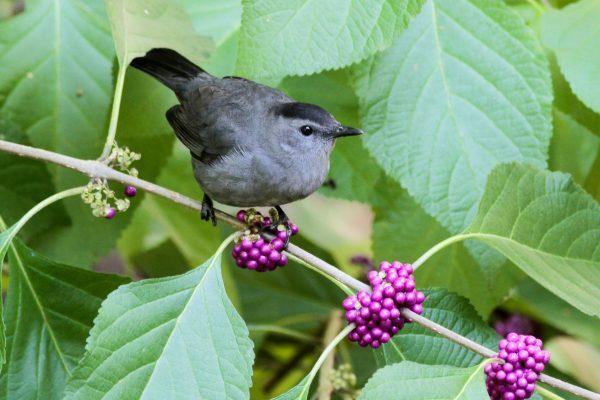 Ten different species in this 10-acre sanctuary including green heron, white-eyed vireo, Carolina chickadee, Carolina wren, northern cardinal, cedar waxwing, common raven, red tailed hawk, American crow, and Cooper’s hawk were seen. We also were lucky enough to spot a red-tailed hawk in a nest right off the trail. 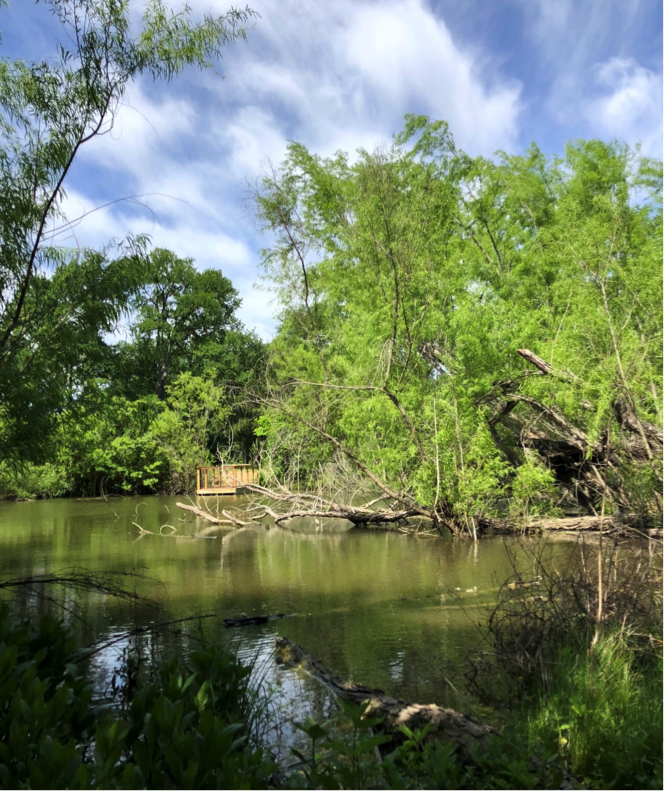 The wind was a testament to the sheer strength of bird nests as I watched the tree bend from side to side, making it impossible to get a good photograph.